/ Modified oct 9, 2014 10:19 a.m.
Medical center had suspended its program late last year; Mesa man spent months on artificial device. Randy Shepherd and his wife, Tiffany. Shepherd is the first recipient of a heart since UAMC revived its transplant program this year. After suspending its heart transplant program late last year, the University of Arizona Medical Center discharged its first transplant patient just after noon on Wednesday. Randy Shepherd got his new heart from a donor at UAMC on Sept. 15. As a child, he survived two bouts of rheumatic fever, but his heart was severely damaged. He received an artificial one last year. Shepherd said he’s most excited about being reunited with his three children, whom he hasn’t seen in months. “I just can’t wait to wrap my arms around my little boy and give my girls both a hug. Spend some time with them," he said. Shepherd walked the 4.2-mile Pat Run in Phoenix earlier this year, when he had an artificial heart. He said he’s planning on taking part in the race next year, but instead of walking he wants to run. Shepherd and his wife Tiffany, who live in Mesa, will spend the next few months in Tucson to be close to the hospital. 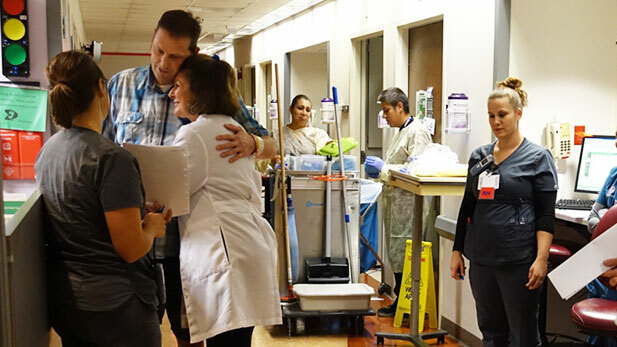 UAMC staff says good-bye to Randy Shepherd, first 2014 heart transplant recipient at the hospital.